In a little valley near the village of Cazedarnes, hidden away from sight, lies the Abbaye de Fontcaude. This monastery was founded in 1179 as a Premonstratensian monastery, and stayed in the possession of the Premonstratensian Order until the dissolution of the monastery during the French Revolution, in 1791. Today the buildings of the former monastery are in private ownership, and members of an association, the friends of Fontcaude Abbey, have been working on restoring what is left of the monastic buildings. The church and remains of the cloisters are now open to the public throughout the year. It is well worth driving down the winding roads to the hamlet of Fontcaude, and I will write about a visit to the abbey at a later date. My most recent visit was on the eve of the European Heritage weekend, which always takes place around September 21 each year. 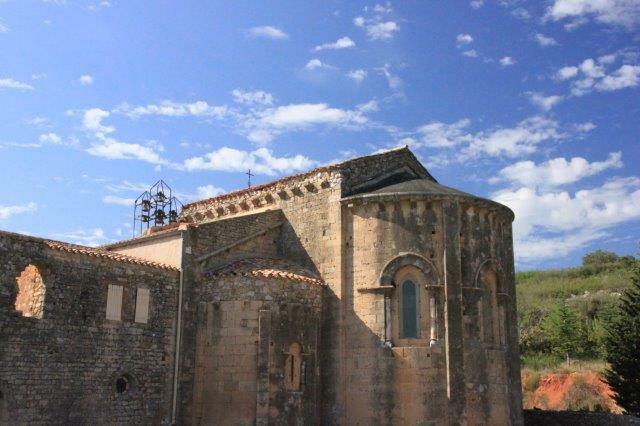 It has become a tradition at Fontcaude that a concert is held at the abbey then, and this year the concert was by an ensemble called Aire y Fuego, air and fire. 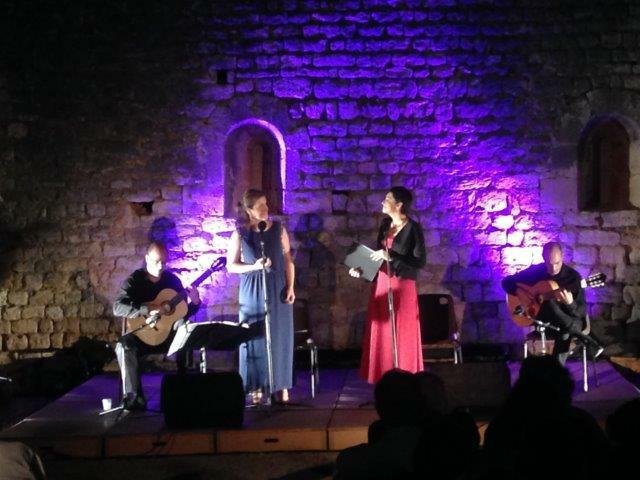 The group was made up of two guitarists and two singers: Ariane Wolhuter (soprano) and Philippe Mouratoglou (guitar) made up the “air duo”, and Sandra Hurtado-Ros (soprano) and Jean-Francois Ruiz (guitar) made up the “fire duo”. 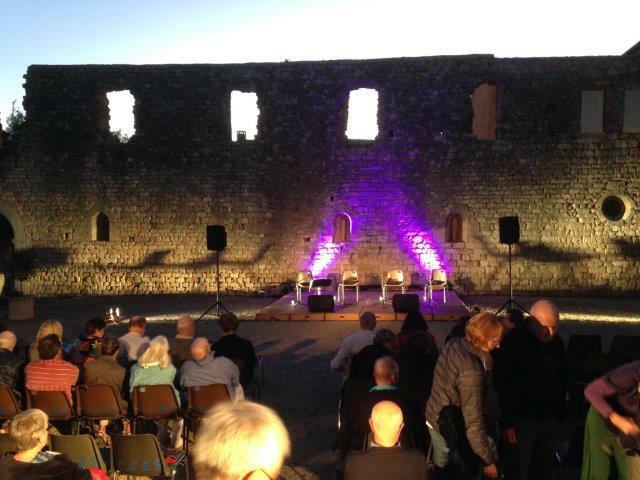 The stage and seating were in the open air, against the magnificent backdrop of an old stone wall, with the apse of the Romanesque church to one side. It was a cool evening, and a lot of people had come prepared, dressed in warm jackets or carrying blankets. As I sat waiting for the concert to start, I wished I had thought of more than just a scarf – but it turned out to be OK :). The passion for Spanish and English melodies, with the voices of two magnificent sopranos, is expressed here with talent and generosity in the duets with guitars : Ariane Wohlhuter, accompanied by Philippe Mouratoglou, sings John Dowland, Benjamin Britten, Dusan Bogdanovic and weaves ample arabesques under the Romanic vaults, and the Sevillane Sandra Hurtado-Ròs, with Jean-François Ruiz, inflames Manuel de Falla, Manuel Oltra, Antonio Machado and Federico Garcia Lorca’s songs… Air and Fire. It is an unforgettable moment ! An unforgettable moment it definitely was!! Ariane Wolhuter sang the English songs with perfect diction and great interpretation. E-mail subscribers, please visit the website to view the videos in this post. Sandra Hurtado-Ros’ interpretation of the Spanish songs was passionate and earthy – you could tell that she was living the songs she was singing. 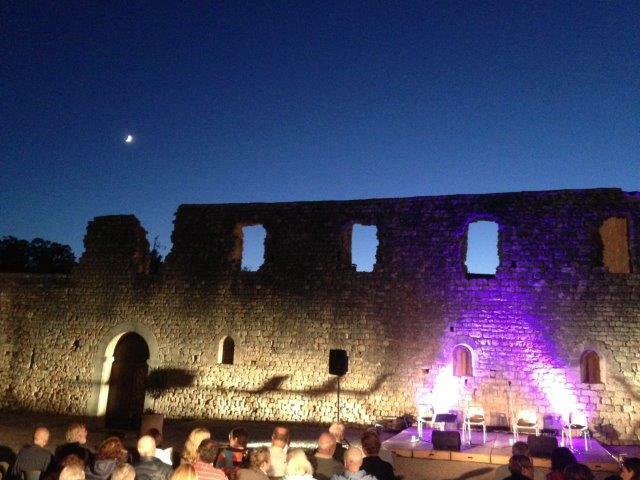 The concert was part of the 10th edition of the festival Les Troubadours chantent l’art roman en Languedoc Roussillon, which runs from May to October – watch out for next year’s edition! 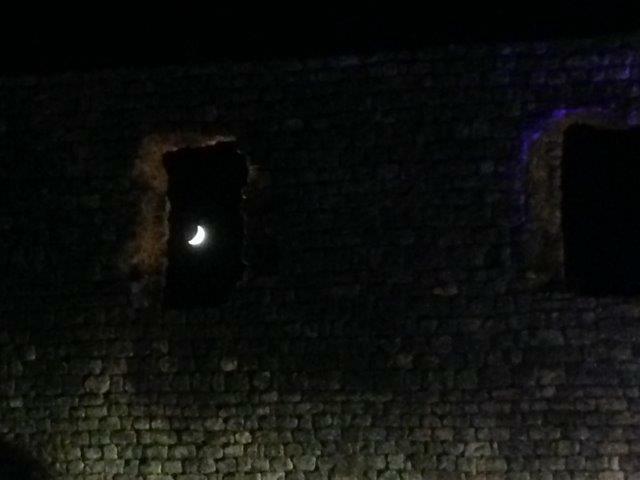 Below are three more videos to give you an idea of what a wonderful and magical evening it was! 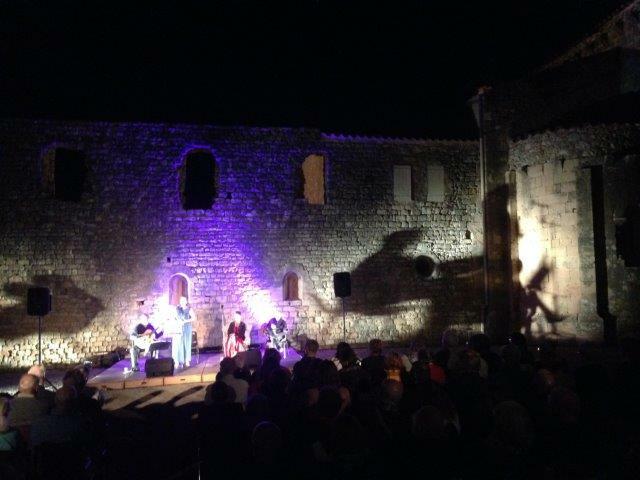 This entry was posted in Places to visit, Travel and tagged abbaye de fontcaude, cazedarnes, concert, fontcaude abbey, languedoc, music by midihideaways. Bookmark the permalink. Splendid! I so enjoyed your videos, and wish I could attend such a festival. Thank you, Inese!! The festivals will come round again next summer! !